Already at the end of month three SUMMA has a prototype developed by LETA. At the end of month 3 in the project, LETA, the project integrator, demonstrated the first SUMMA integrated prototype to the consortium members meeting in Caversham, UK. 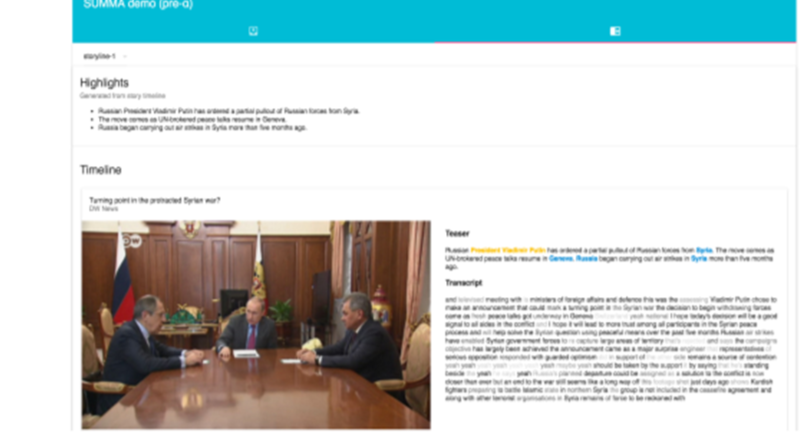 This initial version of the prototype imports Deutsche Welle data through API access, automatically retrieves individual videos, analyses and transcribes them live, and outputs storylines. For now, the tool is able to analyse English-language data.